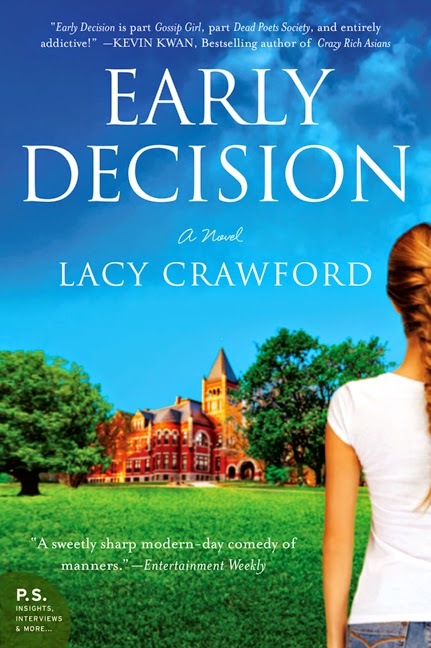 Summary: In Early Decision, debut novelist Lacy Crawford draws on 15 years of experience traveling the world as a highly sought-after private college counselor to illuminate the madness of college admissions. I don't even want to think about this, but Booking Daughter is a sophomore in high school. Naturally, she's thinking about college and grades; however, I'm not sure I'm ready to admit that in less than three years she will be leaving us to pursue a college degree. It's all so overwhelming and more than a little scary for kids and parents. Maybe that was part of the initial appeal of the novel EARLY DECISION by Lacy Crawford. EARLY DECISION tells the story of Anne, a young woman who helps high school seniors write the "perfect" essay for college applications. This book follows Anne as she works with five Chicago-based kids. It shows the "highs" and especially the "lows" of this critical time in their lives, and it definitely features the parental involvement in the process. I enjoyed EARLY DECISION and understand why it's getting so many positive reviews; however, I actually had mixed feelings about the book. One on hand, I found Ms. Crawford's account to be very interesting, and I have a feeling that more than one or two situations in the story are based on her personal experiences as a private college counselor. I thought she did a terrific job of showing the stress and tension between the kids and their parents, as well as the joy and heartache of the entire process. However, I also felt uncomfortable reading this novel. As a mother of a fifteen year old girl, I felt sick about what she and her friends might be going through in a few years. It's all so complicated... and very different from what I experienced almost thirty years ago when I applied to college. One thing I enjoyed very much about this book was that it wasn't just a "tell all" about college admissions. While I did appreciate that aspect of the book, I really liked how this novel delved into many different complex relationships. It probably won't surprise you that the interactions between Anne and the high school seniors was interesting, or that there was a lot of tense moments between Anne and the parents as well as the kids and their parents. However, it might come as a bit of a surprise that the book juxtaposes what's going on in Anne's life with the kids' lives. Anne's parents aren't exactly proud of her career choice. They feel as if she could do so much more than just help kids write better essays. In addition, Anne is at a cross-roads of sorts with her boyfriend. They have a long-distance relationship and, while Anne desperately wants a commitment, her boyfriend seems to be less sure about their future. I actually appreciated Anne's character, even though there were times when I thought she made some bad choices; and I really liked how she helped these kids get to the bottom of what was special to them. I feel as if her guidance provided them with so much more than just well-written essays. EARLY DECISION would make an interesting book club selection. My group in particular would probably appreciate it because we all have kids in high school. There is a reading guide with ten interesting questions. Some of the themes you might want to explore include parent/child relationships, choices, ambition, college admissions, wealth, social class, love, disappointment, and destiny. EARLY DECISION is a unique look at the college applications process and parent/child relationships. Recommended for fans of literary fiction and especially parents of high school students. I have to admit I'm glad that's all behind us. We let Vance navigate the waters by himself but I know college applications have become very complicated these days. I've seen this one around but I thought is was non-fiction; a sort of memoir. I'm still not all that likely to read it, but I'm more interested now that I know it is a novel!